I just bought the Armytek Wizard Pro XM-L2. Supposedly, this is much brighter (1010 lumen max versus 750 max), and a little more efficient than the Zebralight h600. It came with a free Panasonic battery (a very good one) and a free charger. There is also a 15% store-wide holiday discount promo code I was able to use. If you want to take advantage of these deals, do so today or tomorrow. After it was all said and done, I paid $85 for a battery, charger, headband, clip, and the light itself. It also comes with a ten year warranty. I even got free shipping. I already own a Zebralight h600w, so I didn't really need this new Armytek, but it was too good of a deal to pass up. In two weeks, I will try to do a comparison review between my h600w and Wizard Pro XM-L2. If the specifications can be believed (other online reviews suggest that they can be), then this light will become my new primary. Wow! 1010 Lumens! That's unbelievable for one single cell battery!! And a runtime of an hour at that brightness.....Great review of the light at your link! I agree, it's very impressive. As far as performance goes, this is just about as good as it gets... we'll need to wait for the next generation of LEDs before we see anything better. Of course, I don't think I'll be letting mine run on turbo that long... I'm too afraid it will shorten the life of the LED! It's pretty crazy that this light can get hot enough to cause second degree burns if you allow it! rlboyce wrote: I just bought the Armytek Wizard Pro XM-L2. Supposedly, this is much brighter (1010 lumen max versus 750 max), and a little more efficient than the Zebralight h600. When I went to armytek's store they listed it as $99.95 after the 15% off. How/where did you get it for $85? I tried adding an 8% cpf8 promo code but it wasn't accepted. Last edited by ArcticHighlander on Jul 5, 2013 10:40 am, edited 1 time in total. Wow, you saved even more than I did! Highlander, once you get your light, please share your initial thoughts of the light with us! I will try to do the same. Will do, along with a quick comparison with my ZebraLight H600. Unfortunately the lowest setting on this Armytek is .5 lumens and the lowest on the H600 is still .1 lumens. At .1 lumens the H600 is still far too bright to not disturb others or too maintain good night vision. The Zebralight SC600 MKII has a good range from .02 to 900 lumens but is not set up as a headlamp (though it would fit in an after market headband). If this wasn't such a good price I probably would have waited for the ZebraLight SC600w MKII neutral white to come out and put it in a Nite Ize headband. Last edited by ArcticHighlander on Jul 6, 2013 11:52 pm, edited 2 times in total. The .1 lumen setting has not been enough for me to cave with. Sometimes I'll use the .1 setting if the group is taking a rest, but usually I'll just turn the light off at that point. As far as low settings go, the Armytek should be perfect for me. Of course, everyone has different light preferences. I've often thought about getting a high power flashlight to mount to my helmet, especially since there are more options in the flashlight world. I even experimented with a mini Maglite. It worked well, but I must admit that it often snagged on things, and the beam being off-center took a little getting used to. Interesting light. Thanks for posting about the deal. It's tempting as I've been thinking about replacing my older model Zebralight eventually because the twist switch occasionally malfunctions. I get that the Wizard needs an 18650 to sustain this level of light and runtime, but I really wish it would run on an AA at reduced specs (I presume it doesn't) because everything else I have runs on AAs. I see Armytek makes a cheaper AA headlamp, but they are out of stock and I can't even find what it looks like. I am not too familiar with Armytek's lineup, but it's possible that their Tiara model is not yet released. Do the newer Zebralight AA offerings have a twist switch? I think these do pretty good on AAs. I also had inhibitions about getting a light that ran on 18650s. Now, I have no regrets about doing it whatsoever, and have even purchased a second 18650 light. Carrying two battery types in my pack never gave me any trouble, but eventually I'd like to phase the AA lights out of my cave gear completely. The higher energy density means less weight on my noggin. I can understand that there is an initial investment cost of a charger and special battery, but with this deal they give you both for free. Hard to go wrong, IMO. Ordered one of these from Going Gear (great place, I order from them a lot). Shipped today. 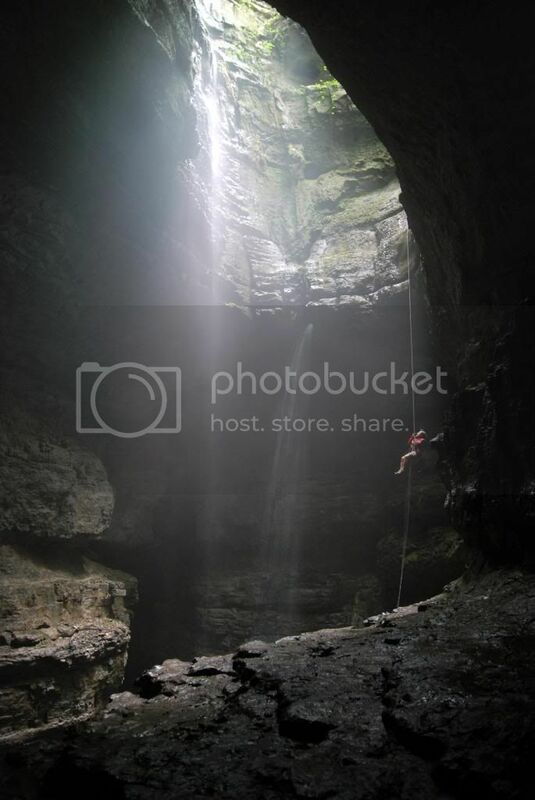 I plan on taking it caving next weekend and will report back with my impressions. rlboyce wrote: I also had inhibitions about getting a light that ran on 18650s. Now, I have no regrets about doing it whatsoever, and have even purchased a second 18650 light. Carrying two battery types in my pack never gave me any trouble, but eventually I'd like to phase the AA lights out of my cave gear completely. The higher energy density means less weight on my noggin. I can understand that there is an initial investment cost of a charger and special battery, but with this deal they give you both for free. Hard to go wrong, IMO. Yeah, I see your point... but I have no wish to phase out my AA lights and other devices. Besides too much invested in batteries and chargers, I also make gadgets that run on AA's. Hard to go wrong with AA's, and you can get replacements anywhere in the world. I would have bought this Wizard headlamp if it also ran on AA's. It obviously has a DC/DC converter anyway. Would have been the perfect excuse for me to *try* and 18650 system while also having the universal redundancy of AA power. NZcaver wrote: I would have bought this Wizard headlamp if it also ran on AA's. If the manufacturer numbers can be believed, there is a noticeable difference in efficiency. The graph I made is not a very good comparison. I later discovered that Armytek posts theoretical lumens, whereas Zebralight posts OTF lumens. In other words, the Armytek is not nearly as efficient as I had first believed.